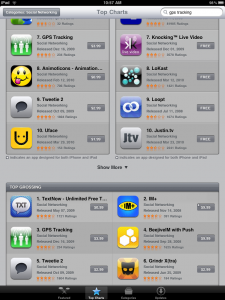 GPS Tracking is the third highest grossing app on iTunes. GPS Tracking is really catching on fast. It’s number 3 on the top grossing app list, and number 7 most downloaded app. It’s no wonder really. The app is so useful. It’s very simple. Find your friends fast using GPS Technology. We’ve been waiting for this technology to become affordable and available to everyone. Now it is. “GPS Tracking one of the must-have-apps in my arsenal.” Joel M.
Try GPS Tracking for free, or buy the unlimited version.